Do you hear the drums echo in the night, or do you hear only whispers of some quiet conversation? 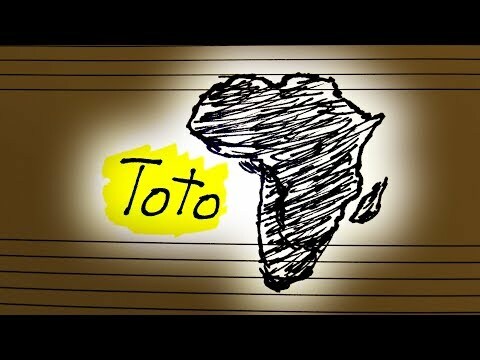 Either way, we're taking a look at one of the most famous songs on the internet, Africa, by Toto. It sounds simple, but Toto was full of brilliant session musicians, and they managed to bury a lot of really clever touches in it, including possibly the most interesting piece of harmony we've looked at yet. Plus, it's got one of the most iconic riffs of all time, so that's pretty cool. Patreon: https://www.patreon.com/12tonevideos Merchandise Store: http://12tonevideos.storenvy.com/ Mailing List: http://eepurl.com/bCTDaj Facebook: https://www.facebook.com/12tonevideos Twitter: https://twitter.com/12tonevideos Instagram: https://www.instagram.com/12tonevideos/ Email: [email protected] Last: Africa music video: https://youtu.be/FTQbiNvZqaY Functional Harmony video: https://youtu.be/Ot_lbUcb-uE Modal Interchange video: https://youtu.be/JtRvGL-fJmY Secondary Function video: https://youtu.be/keY3Dk3RC70 Otherside video: https://youtu.be/U0lI0lfCK-E Script: https://docs.google.com/document/d/1lgTKTsBlnANWqt6YGa0i9wrN7Z6zohIlVL3f_tsLxys/edit?usp=sharing TRANSCRIPTION SOURCES: https://parkarts.pbworks.com/f/toto+-+africa.pdf https://www.sheetmusicdirect.com/en-US/se/ID_No/174430/Product.aspx https://kupdf.com/download/toto-africa-music-sheet_5907085bdc0d602942959ef2_pdf Huge thanks to our gold-level Patreon supporters: Susan Jones Jill Jones Ron Jones Howard Levine Elaine Pratt Ken Arnold Gabi Ghita Kaylor Hodges Brian Etheredge Mark Yachnin William (Bill) Boston Nicolas Mendoza Josh King Gene Lushtak Khristofor Saraga Tom Anton Smyk Michael Hutcheson Mitchell Fund David Roulston Dale Monks And thanks as well to Henry Reich, Eugene Bulkin, Logan Jones, Abram Thiessen, Anna Work, Oliver, Dialup Salesman, Jc Bq, Adam Neely, Justin Donnell, nico, David Zahara, Michael Fieseler, Rick Lees, Ben LaRose, rhandhom1, Harold Gonzales, Marc Himmelberger, Chris Borland, jason black, Dutreuilh Oliver, Dakota Williams, Olivia Andersson, Nick Olman, Joey Strandquist, Daniel Gilchrist, billy roberts, Elliot Burke, Alex Atanasyan, Davis Sprague, Amlor, StarsServant, Steven Kapor, Dave Mayer, Thomás, Greg Borenstein, Tim S., David Tocknell, Elias Simon, Justin Bronstein, Justin Aungst, Alex, Jerry D. Brown, Christopher Wright, Paul Quine, Anamol Pundle, blalo'u, Adil Abdulla, Lauren S., Fabian, Josiah R. Hazel, Ohad Lutzky, Bate Goiko, Jon White, Eivind Vatshaug, Bryan Rider, Kurtis Commanda, Sam, James A. Thornton, Jacob Friend, Benjamin Cooper, Kevin, Joe Galetti, Josiah Scott, Ed Hurtley, Liam Mac Aoidh, SocialScout, John Bejarano, David Barker, Gerhard Blab, drunkwookiee64, CodenaCrow, Nikolay Semyonov, and Pawel Sit! Your support helps make 12tone even better! Also, thanks to Jareth Arnold and Jade Tan-Holmes for proofreading the script to make sure this all makes sense hopefully!